Effective decision-making under real-world conditions can be very difficult as purely rational methods of decision-making are often not feasible or applicable. Psychologists have long hypothesized that humans are able to cope with time and resource limitations by employing affective evaluations rather than rational ones. In this chapter, we present the distributed integrated affect cognition and reflection architecture DIARC for social robots intended for natural human-robot interaction and demonstrate the utility of its human-inspired affect mechanisms for the selection of tasks and goals. Specifically, we show that DIARC incorporates affect mechanisms throughout the architecture, which are based on “evaluation signals” generated in each architectural component to obtain quick and efficient estimates of the state of the component, and illustrate the operation and utility of these mechanisms with examples from human-robot interaction experiments. Effective decision-making under real-world conditions can be very difficult. From a purely decision-theoretic standpoint, the optimal way of making decisions – rational choice – requires an agent to know the utilities of all choice options as well as their associated likelihoods of succeeding for the agent to be able to calculate the expected utility of each alternative and being able to select the one with the maximum utility. Unfortunately, such rational methods are in practice often not applicable (e.g., because the agent does not have reliable or sufficient knowledge) or feasible (e.g., because it is too time-consuming to perform all necessary calculations). Psychologists have long hypothesized that humans are able to cope with time, knowledge and other resource limitations by employing affective evaluations (Clore et al., 2001) rather than rational ones. For affect provides fast, low-cost (although often less accurate) mechanisms for estimating the value of an object, event, or situation for an agent, as opposed to longer, more complex and more computationally intensive cognitive evaluations (e.g., to compute the expected utilities) (Kahneman et al., 1997). Humans also rely on affective memory, which seems to encode implicit knowledge about the likelihood of occurrence of a positive or negative future event (Blaney, 1986). Finally, affect also influences human problem-solving and reasoning strategies, leading to global, top-down approaches when affect is positive, and local, bottom-up approaches when affect is negative (Bless et al., 1996). For (autonomous) social robots that are supposed to interact with humans in natural ways in typically human environments, affect mechanisms are doubly important. For one, such robots will also have to find fast solutions to many of the same kids of difficult problems that humans ordinarily face, often with the same degree of uncertainty–if not more. Hence, affect mechanisms in robotic architectures might help robots cope better with the intrinsic resource limitations of the real world. The second reason why affect mechanisms are essential for social robots is grounded in their intended role as social agents interacting with humans. 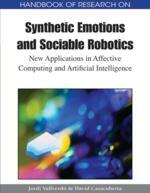 For those interactions to be natural (and effective), robots need to be sensitive to human affect, both in its various forms of expression and in its role in human social interactions. We have started to address affect mechanisms that can serve both functions in our DIARC architecture (Scheutz et al., 2006, Scheutz et al., 2007). DIARC is a “distributed integrated affect cognition and reflection” architecture particularly intended for social robots that need to interact with humans in natural ways. It integrates cognitive capabilities (such as natural language understanding and complex action planning and sequencing) (Scheutz et al., 2007, Scheutz et al., 2004, Brick and Scheutz 2007) with lower level activities (such as multi-modal perceptual processing, feature detection and tracking, and navigation and behavior coordination, e.g., see Scheutz et al., 2004, or Scheutz and Andronache 2004) and has been used in several human subject experiments and at various AAAI robot competitions (Scheutz et al., 2005, Scheutz et al., 2006, Schermerhorn et al., 2008, Schermerhorn et al., 2006). Most importantly, DIARC incorporates affect mechanisms throughout the architecture, which are based on “evaluation signals” generated in each architectural component, which effectively encode how “good” something (e.g., the current state of the world) is from the perspective of the component. Affect: stating how emotions moves us in order to start actions action selection, Procedures to decide which action is more proper to a certain context goal management, Procedures and algorithms to sort the goals on a system according to the priorities that emerge from the context affective architecture, Constructing systems able to take decision based on simulations of the affective processes human-robot interaction Discipline that studies how humans and robots can interact, and finding ways to improve this interaction.